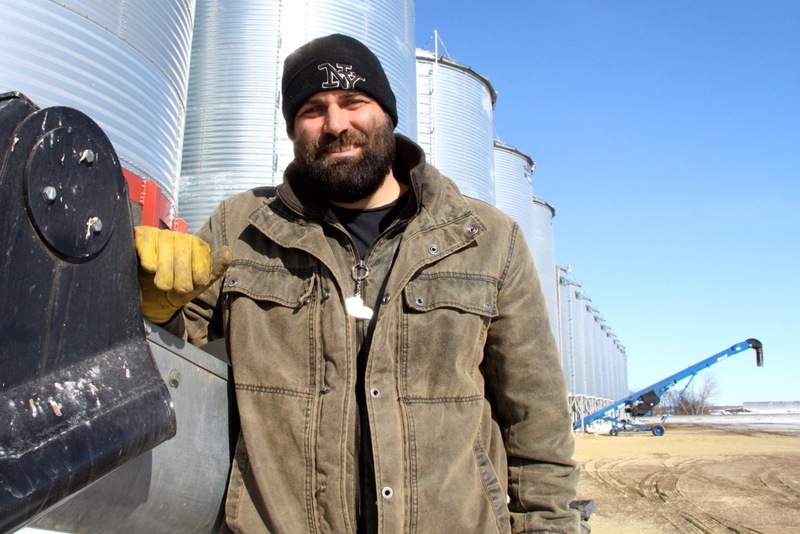 There are 25 grain bins in Travis Heide’s farmyard, including six massive ones with a capacity of 70,000 bushels each. In total, the bins can store around 550,000 bu. of grain. That’s enough for 10,000 acres of spring wheat, assuming an average yield of 55 bu. per acre. For most prairie farmers, 550,000 bu. of storage would be more than enough. Not for Heide. He has two other grain storage yards — one near Stockholm, Sask., and another by Whitewood, Sask. Heide needs a massive number of grain bins because he farms 40,000 acres of cropland in eastern Saskatchewan. Again, for most growers, that would be more than enough. He’s converting all 40,000 acres to organic. “We’re half and half this year, between organic and conventional,” said Heide. If all goes according to plan, Heide will have the largest organic farm in Canada and possibly in North America. “I have never heard of anything like that,” said Laura Telford, organic development specialist with Manitoba Agriculture. Telford and other players in Canada’s organic sector haven’t heard of Heide because he’s been quiet about his transition to organic. He’s created a company called Organics Canada Ltd. and will be producing a list of organic commodities, such as barley, oats, lentils, peas, wheat and hemp. The size of the operation is impressive and it’s more remarkable because Heide just started farming full-time in 2014. Heide, who’s in his late 30s, grew up on a farm near Moosomin, Sask., and is the oldest of four brothers. He was involved in the farm as a kid, and as a young adult he earned a business degree from the University of Saskatchewan. Like thousands of other young men and women from Saskatchewan, Heide moved to Calgary in the 2000s. He took a job with a commodity trading firm and then started his own grain trading company. Around 2007, Heide’s father wanted to retire and asked his sons if they wanted to take over the family farm. Heide and his siblings weren’t interested so his father ended up selling the farm. At that time, Heide was in his late 20s and he decided to travel to Africa. He was still interested in agriculture and helped start a farm in South Sudan. After returning to Canada, a family friend in Moosomin asked Heide to help with the harvest. Heide ran a combine for the neighbour in the fall of 2010. “That’s what really whet my appetite for farming,” Heide said. For the next couple of years he did custom combining in eastern Saskatchewan and managed a farm for local group. Heide then met Robert Anjelic, a Calgary businessperson who runs Anjelic Land Inc. and now owns 203,000 acres of Saskatchewan farmland. “A realtor that Robert had bought some land with … gave my number to Robert,” Heide said. Heide agreed to do it and found people to help him. Anjelic recognized, immediately, that Heide is a hard worker. “He puts his nose to the grindstone,” he said. Soon after Heide and Anjelic met at a Tim Hortons, where Anjelic asked Heide to manage farmland around Waldron and Whitewood. Heide agreed and in the spring of 2014 he seeded 7,000 acres of cropland with his brother, Garret. “We looked after machinery, people and all that,” Heide said. Anjelic bought another parcel of land around Stockholm, south of Waldron on Highway 9. That land was also in pasture and Heide decided to farm it organically because the previous owner hadn’t used pesticides or fertilizer on the land. “That was kind of the beginning of the organic journey,” Heide said. Heide grew up on a conventional farm and wasn’t opposed to pesticides, genetically modified crops and the other tools of modern agriculture. However, what he noticed upon returning to farming was the price of inputs. Since he was managing freshly broke pasture land on part of the farm, Heide soon realized that the economics of organic were better than conventional, especially when crops such as organic flax are selling for $37 per bu. “In organic, our costs were far lower, and because the value was up there, it just made sense,” he said. The economics were right, but another important and more personal factor pushed the decision along. His wife, Amy, grew up on Vancouver Island in a family committed to local, organic food. Amy and Travis, who have three young girls, had many conversations about organic versus conventional after they began farming near Waldron. “I remember saying, ‘you can’t do it just because of money. You have to believe in it in order for it to work,’ ” Amy said. Heide didn’t say if that argument ever won him over, but he admitted that he now thinks differently about crop production. What’s more obvious is that Heide wants to accomplish something that others claim can’t be done. Since beginning with 7,000 acres in 2014, the farm has rapidly expanded. Heide began buying land and Anjelic bought more property. Soon, they had accumulated 40,000 acres on three parcels at Waldron, Stockholm and Whitewood. Last spring, Heide was considering keeping half of the farm in conventional because he was planning to grow canola and soybeans. However, managing a conventional-organic operation is not easy because equipment must be cleaned for organic certification. “We had done it the year before and it was a lot of work,” Heide said. Jumping in the deep end and managing 40,000 acres requires people. Heide, along with his brother, Garret, have about 15 full-time employees. Most of the employees are friends and acquaintances who moved to eastern Saskatchewan to work on the farm. “Initially, it was friends of mine from New Zealand,” Heide said. Some of the employees have experience with livestock, and Heide is considering adding cattle to the operation, mostly because livestock are critical for getting phosphorus to the soil. They may need 40,000 head of cattle to maintain soil fertility on 40,000 acres, Heide estimated. An organic farm with 40,000 acres, 15 or more employees and potentially 40,000 head of livestock is an incredibly complex operation. Nonetheless, Heide is committed to doing something big and meaningful. 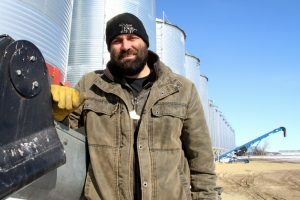 He envisions a future where some of his employees start their own organic farms, in other parts of Saskatchewan, and the Waldron operation becomes a hub to discover and develop best practices for organic production. “If I’m only creating opportunity for myself, then what’s the point?” Heide said. Robert Arnason is a reporter with The Western Producer. He can be contacted at robert.arnason@producer.com.